LONDON Any hopes that the troubled eurozone economy was poised for a solid rebound from recession were under threat of being dashed Thursday by latest figures showing the industrial sector sliding into reverse during July. 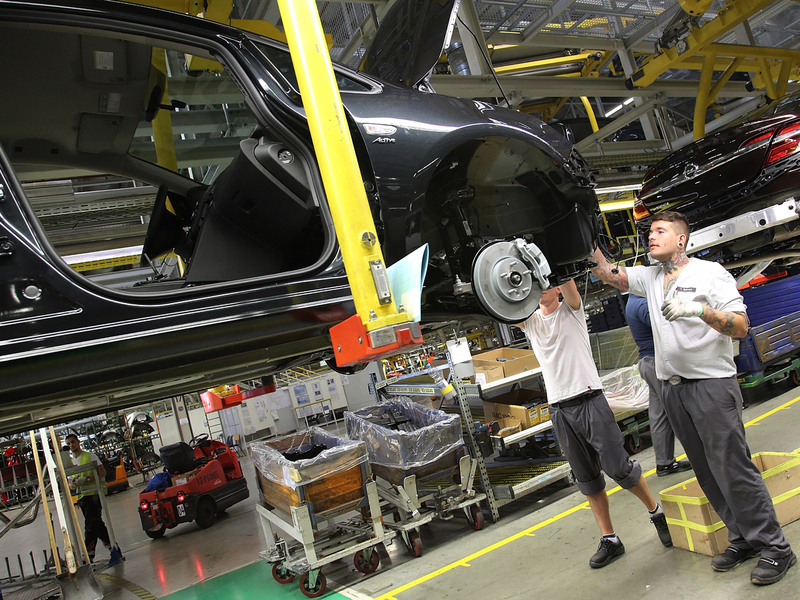 Eurostat reported that industrial output, which includes everything from the making of high-end Mercedes cars to oil & gas extraction, slumped 1.5 percent in July from the previous month. The decline, which followed a 0.6 percent advance in June, was much bigger than expected - the consensus of analysts' forecasts was for a far more modest decline of around 0.3 percent. The fall, which was fuelled by a 2.3 percent drop monthly decline in Europe's heavyweight economy, Germany, is also likely to stoke fears over the state of the eurozone economy following its modest rebound from recession in the second quarter. The monthly fall took the annual rate of decline down to 2.1 percent from the 0.4 percent recorded in June. Figures last month confirmed that economic growth across the 17 European Union countries that use the euro grew by 0.3 percent in the second quarter following a six-quarter recession, the longest it has experienced since the single currency was launched in 1999. "July's fall means that, even if production posted monthly rise of around 1 percent in August and September, it would still roughly stagnate in Q3 as a whole," said Ben May, European economist at Capital Economics. "The numbers provide an early indication that the eurozone economy is unlikely to have gathered more momentum in Q3 and may even have lost some steam," he added. Though the key hurdle facing Europe's manufacturers -- the region's debt crisis -- has abated over the past year following the European Central Bank's offer to buy up unlimited amounts of government bonds, manufacturers still face a tough time from spending cuts in countries such as Greece and Spain, tight credit conditions and high unemployment. "This is particularly true of the southern periphery eurozone countries, but France and the Netherlands also continue to face significant headwinds, despite the former exiting recession during the second quarter," said Howard Archer, chief European economist at IHS Global Insight. "Meanwhile, global growth is muted and fragile, which threatens to limit the upside for eurozone exports."